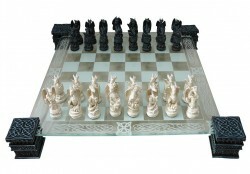 Fantastic gift idea in the form of this gothic dragon chess set. The glass board fits into 4 stony corner pieces. The corner pieces are gothic plinths with beautiful designs. Each chess piece is a white dragon or a black dragon. The pawns are dragon hatchlings. The rook is a dragon wrapped around a castle tower. The king and queen dragons both have crowns and sit in a bath of crystals. Lots of great little details.